Each test consists of 8-10 multiple choice questions and one short answer question. They are based on the weekly stories in the Wonderworks workbook. (Not cold read stories.) 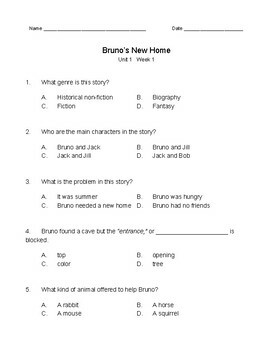 You can also add the Vocabulary Test provided by McGraw Hill for a longer test. *This is the entire book. Units 1-6, with 5 weeks/stories in each unit for a total of 30 tests. Answer keys are included for each test.